Have you ever wondered why people go out and sweat for a charity? They may just like to move, no matter what, or they might be focused on the mission of the charity sponsoring the run or walk. But, research by some respected folks has found that people are more likely to support a cause and to donate IF they suffer a bit. Yep, it's called the "martyrdom effect." It's a real thing. And the martyrdom effect seems to be more potent when we suffer for a terrible problem or disease or condition. These days that suffering can take all kinds of forms. Like the IceBucketChallenge for ALS, or the PolarPlunge for the Special Olympics, or maybe just a 5k with your animal best friend for Strut Your Mutt supporting Best Friends Animal Society (hardly a case of martyrdom in my view, however). Martyrdom aside, running, walking or biking for charity is such a great idea. It only takes a few hours at most, you will raise money for a good cause, and you can get healthy...all at the same time. What are Charity Runs and Walks? Can you believe that "thons" have only been around since the 1970s? The March of Dimes put together its first event in 1970. Since then, that successful event has been replicated by just about everyone. Now known as March for Babies, that event is still going strong too. Walk/Run/athons are both competitive and non-competitive races sponsored by many charities to raise funds and as a way to involve many more people than they might otherwise in their causes. Participants usually pay a registration fee and collect pledges. In return, they get to enjoy a great walk/run that is organized for them, snacks, drinks, T-shirts and other mementos. Walks and runs can be enjoyable family activities or arrange for a bunch of friends to go along with you. Energetic participants can raise thousands of dollars for their favorite charities with the online tools most large runs/walks provide. If you want to do more, charity walks and runs need lots of volunteers on the day of the run or walk. You might stuff information packets, take registrations, help set up the route, or distribute drinks during the event. Perhaps the best way to find a charitable walk/run is to check your local paper or its website. Dozens of local organizations run charitable walks/runs every weekend in your area. You can also try searching the web using "walk" or "run" plus the name of your state. Find a walk/run/ride for a cause you feel passionate about. Learn all about the event's expectations and requirements. 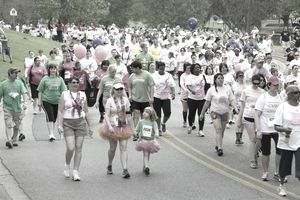 Some events require participants to raise a specific amount of donations and pay a registration fee. Raise money with enthusiasm. Tell everyone you know about your participation and urge them to support you and the cause. Research has shown that people who use online social media to raise money for their causes bring in six times more money than those who don't use it! But, also be reasonable about how far you will walk/run/ride and about how much money you hope to raise. Set yourself up for success, not a failure. Check with and then ask your employer to match or otherwise support your cause. Get moving now. Help a cause and get in shape at the same time. If you are curious about the whole field of charity fundraising with athletic events, check out the Peer to Peer Professional Forum. It is the professional group for the organizers of charity athletic events. There is a report on the organization's site that lists the 30 top athletic event fundraising programs ranked by revenue.